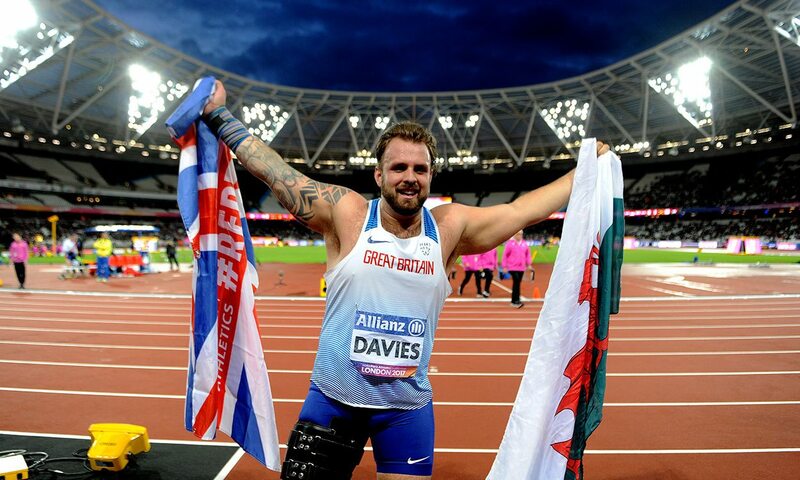 With an almighty roar, Aled Davies launched the shot put further than ever before to complete an impressive throws double at the World Para Athletics Championships in London on Saturday night. The Rio Paralympic champion had been on the hunt for a second world title in the UK capital after his F42 discus win in a championship record last weekend and he found it after a world record throw of 17.52m in the second round in front of a passionate home crowd. “As soon as that second throw left my fingers I knew that I’d done it,” said an emotional Davies. “I’ve been working so hard and I am so happy to be able to throw a world record. “This crowd; they got me on another level tonight,” added the Welshman, who has limited functionality of his right leg having been born with talipes and hemi-hemilia. “I thank every single person out here. What I wanted to do was be at the forefront of this event and take that world record. Victorious by more than three metres, the 26-year-old’s opening throw of 16.02m would also have been enough to win and while his final four throws were fouls, Davies had already done more than enough. Iran’s Sajad Mohammadian secured silver with 14.44m and Frank Tinnemeier of Germany the bronze with 13.87m. There was another world record-breaking performance in the T47 200m as Petrúcio Ferreira dos Santos was hugely impressive in crossing the line with 21.21 on the clock to lead a Brazil 1-2 ahead of Yohansson Nascimento. His win completed a sprint double after his 100m success, which was also secured in a world record time. “I was always focused and motivated for the 200m and what happened in the last two days only motivated me even more for my best effort,” said the winner, who missed out on the chance to go for a sprint treble after being disqualified from the 400m. After his T44 100m bronze behind winner Jonnie Peacock, USA’s Jarryd Wallace went two better to get 200m gold, running 22.37 to take the title ahead of Michail Seitis of Greece with 22.53 and South Africa’s Arnu Fourie with 22.53. In the final race of the evening, Germany’s Johannes Floors stormed to T43 200m victory in a 21.50 championship record from USA’s Hunter Woodhall with 21.72. An incredibly tactical T37 1500m was won easily by Ireland’s T38 800m winner from Sunday, Michael McKillop, as he clocked 4:36.38 after a last-lap battle with Canada’s Liam Stanley. McKillop, whose world record for the event is 3:59.54, successfully defended both of his world titles as he returned to the scene of his double gold medal-winning success from the London Paralympics five years before. Australia’s Deon Kenzie broke the championship record with a time of 4:06.68 to add T38 1500m gold to the 800m silver he secured behind McKillop last Sunday as Jack Gladman placed ninth with 4:32.73 on his senior GB debut. China’s Yifei Yang won the T36 100m in 11.93, as GB’s Graeme Ballard finished fourth in 12.55 and Paul Blake sixth in 12.59, while US wheelchair racer Raymond Martin took the T52 100m title in a 16.83 championship record after silver medals over 400m and 1500m. USA’s Sam Grewe celebrated T42 high jump victory after a championship record clearance of 1.86m, while Thiago Paulino Santos added F57 discus gold to his shot put title after a throw of 46.58m. There was another win for USA’s Michael Brannigan as he took the T20 800m title in 1:54.24, as Britain’s Steve Morris and James Hamilton placed fifth and sixth respectively. Algeria’s Fouad Baka and his brother Abdellatif again finished top two but this time, in the T13 800m, their positions from the 1500m on Wednesday were switched, with Fouad getting gold in a 1:51.60 championship record ahead of Abdellatif’s 1:51.69.